Nautical by Nature: Janie and Jack: Anchors Away! These are so cute! 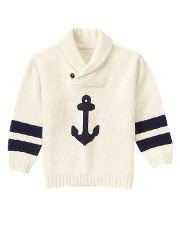 I cannot wait to have to dress little kids in nautical attire! Maybe I missed a post (I haven't read blogs in forever) but have you seen the anchor skirt in LL Bean? I love Janie and Jack! They have the best clothes and it's such great quality! Love it all and must confess that I would wear the hat myself!